The Columbia Anthology of Modern Japanese is the most comprehensive anthology of Japanese literature since the mid-nineteenth century; but, with two enormous (and expensive) volumes, it’s a bit daunting for all but the most stalwart of readers. I was therefore excited to learn that an abridged softcover version of the text has been released. At almost a thousand pages, the anthology still isn’t for the casually interested. As it provides a much wider selection of writers and genres than every other anthology of modern and contemporary Japanese literature on the market, however, The Columbia Anthology is an invaluable resource not only for students of Japanese literature but also for anyone interested in Japan in any capacity. The anthology is divided into six sections spanning from the beginning of the Meiji period in 1868 to the end of the twentieth century. The two sections devoted to the Meiji era include work by naturalists and playwrights such as Mori Ōgai, Shimazaki Tōson, Kunikada Doppo, and Nagai Kafū, as well as essays by Natsume Sōseki, including “The Civilization of Modern-Day Japan.” The anthology then proceeds into the interwar period, which includes the work of authors such as Akutagawa Ryūnosuke, Edogawa Rampo, Kawabata Yasunari, and Tanizaki Junichirō. The section titled “The War Years” is mercifully short but includes stories by Dazai Osamu, Ishikawa Tatsuzō, and Ōoka Shōhei. The “Early Postwar Years: 1945-1970” section is the longest in the anthology and reads like a hit parade of famous postwar writers such as Abe Kōbō, Enchi Fumiko, and Mishima Yukio. Many well-known postwar joryū bungaku (“women’s literature”) writers, such as Hayashi Fumiko and Kōno Taeko, are represented as well. The last section collects contemporary literature from the seventies, eighties, and nineties by both internationally famous authors such as Murakami Haruki and Ogawa Yōko and writers who are prolific and well known in Japan, such as Hoshi Shinichi and Furui Yoshikichi. What is wonderful about this anthology is that, unlike other anthologies of modern and contemporary Japanese literature, it includes lengthy selections of Japanese poetry, both in “traditional” forms (such tanka and haiku) and in more modern forms (such as free verse). Although I am not a connoisseur of poetry in translation and thus can’t vouch for the quality of The Columbia Anthology‘s selections, I am thankful that so many works of modern and contemporary Japanese poetry have been brought together in a single volume. The majority of the original publications in which these translations appeared have long since gone out of print, so The Columbia Anthology is perhaps the best way to familiarize oneself with a rich yet underappreciated body of literature. The anthology also includes dramatic scripts by playwrights and screenwriters such as Inoue Hasashi and Kara Jūrō, texts which are also difficult to find elsewhere. One difference between this volume and some of the earlier collections is related to the evolving view of both Japanese and foreign scholars as to what constitutes “literature.” Many of the earlier collections sought, consciously or unconsciously, to privilege the long and elegant aesthetic traditions of Japan as they were transformed and manifested anew in modern works. […] But many other kinds of writing, ranging from detective stories to personal accounts – always valued by Japanese readers but neglected by translators in the early postwar decades – can now be sampled here. Whatever the level of young people’s interest in manga (comics) and video games may be, literature, as opposed to simple entertainment, often remains the best way to grapple with the problems, and ironies, of the present generation of Japan. On reading this sentence, I somehow managed to raise an eyebrow and roll my eyes at the same time. The context of this statement was a defense of the strength of contemporary literature in the face of a weighty literary tradition, but I wonder why the editors needed to make the distinction between “literature” and “entertainment” at all. Some types of print culture (such as dramatic scripts) are literature, but others (such as the text portions of visual novels) are not? Edogawa Rampo’s grotesque short stories are literature, but Otsuichi’s horror fiction is not? Haiku are literature, but tweets are not? And – most importantly – manga is not literature? Seriously? Despite the editors’ stated desire to expand the scope of what is considered literature, their literary politics are, as I stated earlier, quite conservative. Popular fiction by writers like Murakami Haruki and Yoshimoto Banana is included in the anthology, but the work of such writers has been so resolutely canonized by scholarly articles and inclusion in course syllabi that its anthologization comes as no surprise. It’s good to have “outsider” writers like Tawada Yōko and Shima Tsuyoshi included in the anthology, but all of the volume’s stories more or less fit neatly into the category of “literary fiction.” You will not find the cerebral science fiction of Kurahashi Yumiko, or the historical revisionings of Miyabe Miyuki, or the fantastical explorations of Asian-esque mythology of Uehashi Nahoko, or the socially conscious mystery stories of Kirino Natsuo in The Columbia Anthology. You also won’t find any prewar popular fiction, such as the short stories of Yoshiya Nobuko. This leads me to another criticism I have concerning the anthology, which is that it is remarkably dude-centric. Until the last two sections of the text (“Early Postwar Literature” and “Toward a Contemporary Literature”), there are no female writers represented (save for Yosano Akiko, who has a few poems about flowers and vaginas); not even one of Higuchi Ichiyō’s short stories is included. In the anthology’s defense, many of the women writing before and during the Pacific War, such as Enchi Fumiko and Hirabayashi Taiko, are included in the “Early Postwar” section. Unfortunately, this means that their more overtly political work has been passed over for stories that focus more on “traditional” women’s issues like female sexuality and the family. Furthermore, even though I applaud the editors for including literary essays in their anthology, it frustrates me that not a single one these essays was written by a woman, despite the fact that many female authors – including those represented in this anthology – are extraordinarily well known for their essays. What the editors has done is the equivalent of collecting the most influential essays on literature in North America and leaving out something as important and groundbreaking as Margaret Atwood’s On Being A Woman Writer. In the end, though, I stand by my assessment of the abridged edition of The Columbia Anthology of Modern Japanese Literature as an essential resource to students of Japan. The volume contains many excellent stories, poems, essays, and dramatic scripts that are difficult to find elsewhere, and the editors keep their introductions of writers and literary epochs brief and to the point. As long as this text is supplemented to bridge over its gaps and omissions, I can imagine it becoming the backbone of a respectable introductory course on modern and contemporary Japanese literature, as well as a source of out-of-print translations of the work of less widely taught authors. Review copy provided by Columbia University Press. For a more general audience, I must confess that I am a fan of The Oxford Book of Japanese Short Stories, a handsome collection of thirty-five works of short fiction edited by Theodore W. Goossen. As Goossen explains in his introduction, he chose stories that could comfortably be read in one sitting, and only rarely are the stories in his collection longer than twenty pages. Among these stories are some real gems, such as Miyazawa Kenji’s “The Bears of Nametoko” and Hayashi Fumiko’s “The Accordion and the Fish Town.” Goossen also presents the reader with an interesting mix of writers, many of whom are canonical, but many of whom (such as Kōno Taeko and Tsushima Yūko) wouldn’t be known by a non-specialist. Goossen seems to have also chosen stories for their entertainment value and has paid special attention to themes that should resonate with a broad international audience, such as race, class, and gender. 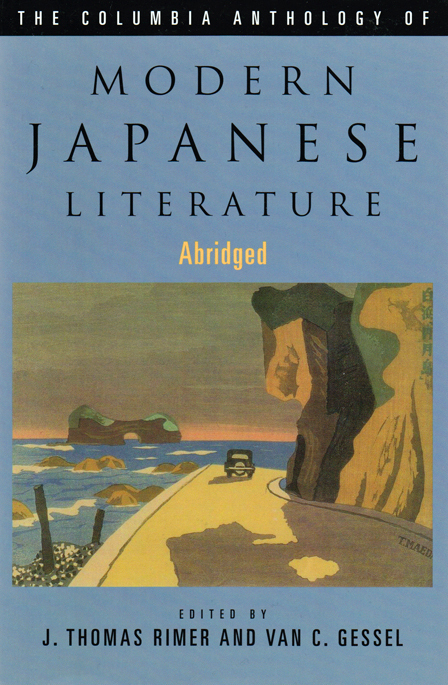 When someone with little prior knowledge of Japan or Japanese literature asks me to recommend a good introduction to modern and contemporary Japanese literature, I usually send them straight to The Oxford Book of Japanese Short Stories, which is more portable and less of a serious business textbook than The Columbia Anthology. Thank you for an excellent review and yes, I agree with you about the shortcomings of the anthology. Other than the Oxford Book of Japanese Short Stories, what other anthology would you recommend to supplement the lack of ‘popular’ literature and women writers? The short answer is that, honestly, I don’t know. I thought about this issue quite a bit before posting my review of The Columbia Anthology, but I can’t wholeheartedly recommend many anthologies of contemporary Japanese literature. For contemporary writing by female authors, I really like Rabbits, Crabs, Etc. : Stories by Japanese Women, and I also have a soft spot for Inside and Other Short Fiction: Japanese Women by Japanese Women. In terms of postwar era literature written by women, I have always enjoyed This Kind of Woman: Ten Stories by Japanese Women Writers, 1960-1976. I think I’ve read all three of these collections at least three times each. This does sound good 🙂 I have the lovely Oxford Anthology, and the Donald Keene-edited ‘Modern Japanese Literature’ is sitting on my shelves waiting to be read. Does The Columbia Anthology focus on short stories, or does it also have extracts of novels (something I’m not too keen on!)? I’m not too keen on anthologies that try to pass off exerts from novels as short stories either! This anthology contains only stand-alone short stories, though, so no worries. It also contains a lengthy novella in its entirety, that novella being The Holy Man of Mount Kōya. Donald Keene’s anthology is such a mess! When he says “From 1868 to the Present Day,” he means “From 1868 to 1968;” and, when he says “literature,” he means “things written by men.” There is a geisha (or something) on the cover of the book, and there are plenty of female characters in the anthologized stories, but it’s as if real women don’t exist for Professor Keene. I remember being very disappointed when I first got my hands on that anthology. I’m delighted to see one of my favorite anthologies noted here. But “abridged” is a word that always spooks me. I have both volumes, hardback and unabridged and want to see and read every wart and bad decision possible. Somebody I’ll just these pieces of information to hold up a bad leg on a table somewhere! I agree that having poetry in these is quite the bonus, because it is endlessly slighted and, as I’m told, a critical component of the literary thinking of many writers that did not publish poetry. There is an apparent catalog of references/concepts that one can call by tangential reference which provides an whole secondary strata of meaning. The Oxford collection is excellent, with a sublime story by Hayashi Fumiko (I’m always on the look-out for her work), and the Columbia unabridged also has an excellent story of hers. Unsure about its presence in the abridged but can’t imagine it would be overlooked. In fact, any decent anthology would be a curiosity if she were not included. Probably the single best easy-access anthology is the dog-eared one that includes both volumes of Donald Keene’s Anthology of Japanese Literature. They are together in at least one Grove Press addition which includes Volume One: Earliest Era to Mid-Nineteenth Century as well as the ubiquitous Volume Two: From 1868 to The Present Day. I consider this edition an excellent introduction to the whole of Japanese literature. Yes, all these volumes cheat women writers by representing the literature of the times as it was then manifest. The cheating continues. There is another conspicuous two-volume set, about as mighty and imposing as Lord Rimer’s edition, and these are two volumes edited by Haruo Shirane (Columbia, 2002): “Traditional Japanese Literature, An Anthology, Beginnings to 1600” and “Early Modern Japanese Literature, An Anthology, 1600-1900. I keep waiting for another addition to the cannon from 1900-2000, but it has yet to appear. I consider this edition an excellent introduction to the whole of Japanese literature. I consider the first volume to be full of condescending, phallocentric comments about female Heian writers and to have more or less ignored any woman writing after the Heian period ended, and I consider the second volume to have ignored the fact that women can write at all (except for Higuchi Ichiyō, but Keene has some lovely sexist comments about her to help justify her inclusion in an otherwise all-male anthology). I think this is both academically lazy and ridiculously offensive, but we can agree to disagree on the matter of the quality of Keene’s anthologies. I haven’t read the first volume of the Shirane anthology, but the “Early Modern” volume seems just as dude-centric as the Keene anthology; it’s like, let’s talk about famous men like Ihara Saikaku and Matsuo Bashō and Chikamatsu Monzaemon and Ueda Akinari and so on and so on and so on. It was frustrating, especially since there has been no small amount of scholarship in both Japanese and English on the female writers (and especially poets) of the Edo period even before the anthology was published in 2002. I am not a specialist in premodern literature by any means, but even I own enough reference books to know that the fantasy of women not writing at all between the Heian period and the Meiji period is pigheaded and just plain wrong. Shirane’s decision not to commission a host of new translations of the work of female writers strikes me as downright weird. Therefore, when you say “all these volumes cheat women writers by representing the literature of the times as it was then manifest,” I wonder what you mean by “then”? Do you mean the “then” of the premodern period, when there were tons of women writing, do you mean the “then” of the early modern period, when there were tons of women writing, do you mean the “then” of the modern period, when there were tons of women writing, or do you mean the “then” of the postwar and/or the contemporary periods when the anthologies were put together, when obviously there were/are tons of women writing? Whatever you mean, there is no excuse for male editors perpetuating the idiotic idea that women were/are not writing anthology-worthy work. This isn’t cheating the writers not included in the anthology, it’s cheating the readers who have come to the anthology expecting some sort of representative introduction to Japanese literature. So, on one hand, I think The Columbia Anthology is sexist, and I believe this sexism is needless and significantly lowers the overall quality of the anthology. On the other hand, it is not as sexist as other anthologies. But that’s okay; we can take baby steps. Anyway! The Hayashi Fumiko story in the The Oxford Book to which you’re referring, “The Accordion and the Fish Town,” is such a good story! The translation is of remarkably high quality as well. In fact, that story is one of the strongest selling points of the book as a whole, in my opinion. The Hayashi Fumiko story in The Columbia Anthology is “Blindfold Phoenix,” which is a pleasure to read but less overtly political. I offered only my own views about a topic in which I am not a scholar, and so would not know who has been cheated in the process. I have nothing to say about what I didn’t read. What remains after all the phallocentric vermin have eviscerated it of all things female is all I know. Pity me. This corrupt and culturally myopic process dominates my stunted thinking about all matters of art and history; it’s all I’ve ever known. The phrase “as it was manifest” was intended to indicate the writers that were glorified and praised, published or endlessly duplicated for consumption at the time. Perhaps I guessed wrong that women writers were denied an audience then, instead of later being air-brushed out of history at a later date. In any case, I retract anything I said if it intersected sexual politics, actual or implied, in any way. Hell, it could be assumed that the reason WHY I like these anthologies is explicitly because of my sexist bias. I don’t think so, but who can really know their own motivations–I apologize for that too! With or without the necessary stats and scholarship to prove it, I believe the whole of literature is sexist, as well as all aspects of the world we inhabit–and racist as well. That’s my viewpoint. Certainly I would feel a greater sense of injustice if I was a member of the groups which were slighted, but I am not. All I have to go on is the pack of lies and tortured rewrites of history that cretins like Rimer and Keene, men I’ve long admired in my deluded state, have puked up for our general contamination. Please forgive me–I really love these anthologies! Judging from your exaggerations and colorful language, one might almost think you’re not taking the issue of persistent sexism in the anthologization of Japanese literature seriously. I myself tend to take it seriously because prodigious and well publicized efforts have been made to expunge it from anthologies of literature written in European languages. The fact that it remains in anthologies of Japanese literature is another chip in the pile of evidence that Japanese literature is not considered “real” literature on par with literature written in Western languages. It’s also a “there are four lights” situation in which what you see with your own eyes and know to be true is consistently denied by figures of authority, such as the professors who pioneered the field of Japanese literary studies in America. This is not to say that brilliant and enormously productive scholars and translators such as Keene and Shirane are all bad all the time, but overt sexism passed off as “tradition” is a huge misstep in academic credibility, and it’s necessary to expose this misstep for what it is if it is ever to be corrected in the future. I’m simply trying to argue that the sexism inherent in these anthologies is unnecessary and insulting to the reader. As you have astutely pointed out, one can only know what one reads; and, if these anthologies are all that one has read (as is the case with many students of Japanese literature, I would imagine), then one would never know that yes, in fact, there were many female writers of both the large-audience and the small-audience varieties. So the ukiyo-e artist Katsushika Hokusai had two daughters, right? Not only were these two women extremely active members of the artist’s studio (and may in fact have been solely responsible for the vast majority of work released in Hokusai’s name during the artist’s later years), but they (and Ōi in particular) were also celebrated artists in their own right. So, if you were making an anthology of ukiyo-e prints, and you had space for, say, twenty prints, would you use all twenty spaces for Hokusai prints without mentioning his daughters, or would you devote one or maybe even two of these twenty spaces to work by Katsushika Ōi, which is absolutely gorgeous and fascinating from an art historical perspective? I mean, why wouldn’t you? By doing so, your anthology not only becomes more diverse and thus more interesting, but you would also be able break away from tired, boring stereotypes that have been repeated an infinite number of times before you decided to put together a “new” anthology. In other words, it’s not about THE MARCH OF THE FEMINAZIS and THE HATING OF TEH MENZ; it’s about creating an interesting, high-quality, and meaningful anthology that achieves its goal of representing an extremely large body of literature as accurately as possible while providing its audience with useful information and perceptions about this body of literature. Hear, hear! I have to admit that back in the days when I studied Japanese, I too read the Keene anthology with delight, rather unquestioningly accepting his selection and his judgement. I have now mellowed with age and want to see a much broader variety of literature (women’s, manga, science fiction, fantasy, whatever) represented. Aren’t all these labels a bit meaningless? I just want to read some well-written, thought-provoking stuff. Exaggerations and colorful language are my stock-in-trade developed over a long life of hard work. I stated my feelings regarding the pervasive and universal presence of sexism and racism and meant it. When I say it doesn’t effect me, my fields of study or my general range of interests, I also mean it. When I speak to teachers I begin to think that satori is a frivolity when compared to this year’s syllabus. When they are musicians, as they frequently are, life outside music is seemingly a keyhole through which blind folk peer. Certainly sexism effects my daily life. I’m married to an intelligent and perceptive powerhouse: I can’t visit Islamic countries because of her general rage at the limitations placed on women there. Mind-numbing two-dimensional sexism in most every UnitedStatesian cultural artifact most generously in film and TV isn’t a rarity, it’s a staple. Oh it’s bad–it’s mighty bad! Still, I sit in the den, read my books and doze and have never once pondered the potential damage done to world literature via self-absorbed editors. I just enjoy what I get, and I acknowledge that this is *extremely* limited. I search Amazon for *translators and publishers* for Pete’s sake, rather than authors in order to find what may have been made available in translation. I thought I was dedicated enthusiast rather than a gullible shill for cultural hegemony. Live and learn. Your reference to Hokusai’s daughters is directed at sexism, but I see the same thing in music collections where the same hackneyed and well-known pieces are trotted out again and again as if time crystallized around 8 people and 20 pieces. Every collection is a screw-job. But I haven’t parsed it as a specific injustice to a specific group of types. I classify is as academic sloth, not academic chauvinism. Guess what’s being performed at the local symphony this year? Tchaikovsky and Brahms–what else?!? Many musicians I know clawed their eyes and shrieked when 20 hours of Ken Burn’s remedial course in the “history” of jazz did not include a single white musician as representative of anything but cultural theft or commercial opportunism. In the early 90’s, a very good woman, and a good friend, fell in love with a white ex-patriate South African here in the USA. She went to visited his homeland and described a bucolic country setting and the excited attempts to sell her folk arts wherever they stopped. She came as close to saying “happy darkies” as I’ve heard in life. Unable to conceal my rage, I explained what kind of world she had visited; the poverty and human misery. She burst into tears. I immediately backed up and tried to ameliorate the situation, but she waved me off saying she wasn’t hurt by me but by the realization she had been played for a sucker; her tears were tears of shame. Seeing an anthology–all anthologies!–of Japanese literature as intentional sexist assaults by “dudecentrics” apparently explicitly intended to limit great women writers from reaching a reading public scores or centuries after their demise–it’s just not making me feel the shame. I classify is as academic sloth, not academic chauvinism. I think it’s both; but, as neither are intentional, it’s a useful project to call both laziness and chauvinism out for what they are. Still, I sit in the den, read my books and doze and have never once pondered the potential damage done to world literature via self-absorbed editors. I just enjoy what I get, and I acknowledge that this is *extremely* limited. After this discussion, you can probably understand what I found upsetting about such an authoritative statement. You were essentially saying “I consider [the anthology that has almost no female writers] to be an excellent introduction to the whole of Japanese literature,” and that’s just silliness. Anyway! If you search Amazon for translators, I really like Stephen Snyder, Michael Emmerich, and Juliet Winters Carpenter. Although I have recently noticed that it’s been getting harder to search Amazon by translators. I wonder what’s up with that? I’m glad you called out the editors on the male-centric content of the anthology. I’m always really sad (but never surprised, which is sadder) when equal treatment of works by women authors are underrepresented and undervalued. It would be great if they’d publish a manga-anthology, too, as a Serious/Important Literature. How are Rose of Versailles and Nausicaa not both Very Important, Game-Changing Zeitgeist Moments as well as Some of the Best Literature of the 20th Century? Nausicaa is like Heart of Darkness with pictures! Also, thanks for the Atwood article–great stuff as usual. It would be great if they’d publish a manga-anthology, too, as a Serious/Important Literature. Yeah! Wouldn’t this be awesome? …but of course someone always has to do something for the first time. I can still dream, right? By the way, wouldn’t it also be awesome for the Rose of Versailles manga to see a new translation (not that there was anything wrong with the old one, but it’s virtually impossible to find anywhere)? RoV translation: someday, we should collaborate and DO IT. VIZ, call me!! That’s a wonderful idea! Fingers crossed that it works! On a lighter note (!) how is the paper in this version? Decent pages, or academic virtually see-through stuff? The paper approaches academic virtually see-through stuff, but it’s not as bad as many of the Norton anthologies, and the overall publishing quality is fairly high. The pages are large and the font and margins are on the small side, but still, everything is legible and it’s not nearly as bad as it could be. You probably can’t take this book into the bath with you, but you’re not going to go blind reading it either. This is such a good question! I never give publishers enough credit. Columbia University Press did a good job with this one, they really did. What do you suppose is the definition of literature then? I myself am an avid manga reader and I wholeheartedly believe that manga is literature. Some manga do offer intellectual and artistic stories and characterizations, so it is unfortunate that the lack of words and the usage of drawings as a medium seem to be the reasons why some people are reluctant to acknowledge manga as literature. I’m a graduate student, currently enrolling at a Japanese university. I’m interested in researching about translation of manga into my native language and how the translation shapes my nation’s perception of Japanese people. I am planning to discuss manga as literature in my thesis because my directed research is actually under the Japanese literature department. And I think it is only right that I dedicate a part of my research to argue that manga is indeed a part of Japanese literature. On an additional note, do you happen to know any reading materials related to this matter that you would recommend? Thank you very much and I hope I’m not too late.